Network design and network configuration are two different things. In the first place, almost every course will tech you how to configure a network. Not only these courses will teach you how to configure a network, but also how to troubleshoot it. As a matter of fact, only thing these courses will not focus at is designing a network. Not to mention, you need a network first to configure it! When a new startup starts a company, it doesn’t have a network. They need you to design a network for them. Actually, designing a network is so important that, Cisco has a separate certification track for network design. If we don’t design a network carefully, it will collapse soon. With this in mind, Cisco has various network blueprints for making designing process more effective. Cisco Three Tier Network Architecture is one of them. You can find this blueprint online to use it. As you can see, above figure is downloaded from Cisco website. This is the basic architecture of smallest enterprise network. Without any network architecture, you can just use switches. You can build a large network by using daisy chain topology. But after a time, your network will be overwhelmed with lot of network devices. In that event, there is a possibility that you will loose a large portion of your network if a single switch spots working. In a word, a network without proper design is messy and hard to manage. Here comes the three tier network architecture. This network architecture is a layered approach. Meaning, there are three layers of network. Access layers is mainly switches. As a matter of fact, this is the layer, where every end devices are connected. It can be computers, CCTV, printers or anything. Simple switches with lot of ports are used in this layer. In distribution layer all the switches from access layer is connected. Because of this, switches with very large number of ports are used in this layer. In addition, switches of this layer has redundant power supplies, redundant cooling systems. Because, any of this switches fail, whole network will go down. For example, Cisco 2600,4000, 4500 series devices can be used in this layer. 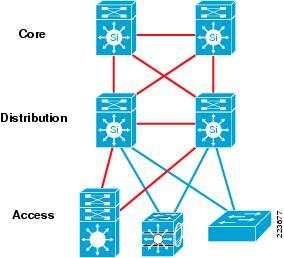 Core layer is needed when network spans in more than one building. Given that, if different buildings have their own distribution layers, then all these distribution layers are connected to the core layer devices. In effect, core layer serves to interconnect the distribution layers. High end devices like, Cisco switches 7000, 7200, 7500, and 12000 are used for a WAN network. So now you know the basic architecture of a network. This is the smallest possible network architecture. As a enterprise grows bigger, network design becomes more complex. We need different design then. In our later post, we will discuss about a bigger network architecture. Thanks for being with us!